So what is a bulb exposure setting, why would you ever want to use it, and how is it different from the other exposure modes? You can use the bulb setting for practical uses as well as an infinite number of creative uses as well. My 70D set on bulb mode. But first we need to understand what an exposure in bulb mode is. The Bulb Setting on your camera lets you manually hold the shutter open for any length of time you want. Instead of the camera deciding on an exact amount of time such as 1/30th of a second or perhaps 2 seconds, the shutter will stay open as long as you hold the shutter button down. One of the practical applications is simply when you need to make an exposure that is longer than the camera's slowest shutter speed setting(which is often 30 seconds). This is almost always a situation when you are doing night photography. 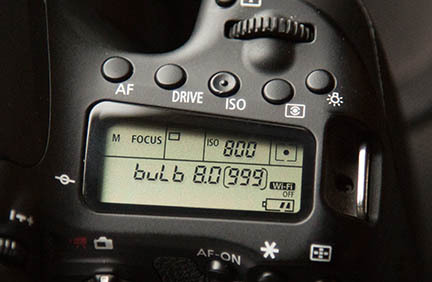 You have 2 ways to set your camera on its bulb setting. You can set your camera to make a bulb exposure either by setting it on the camera dial on top of your camera or by going into the settings within your cameras menu. It's real quick and easy to set on DSLR cameras and higher quality point and shoot cameras that have the exposure dial on top of the camera like the one shown above. In newer cameras with touch screens you simple have to find it within the menu and you're all set. Use Manual Exposure. This is highly recommended although not mandatory. In most situations you will want to check out your photograph on your playback and make adjustments to shutter speed or aperture using a manual exposure mode. Use a tripod. This is a must do tip needed to avoid massive blurriness in your photograph. Use a cable release or remote trigger. 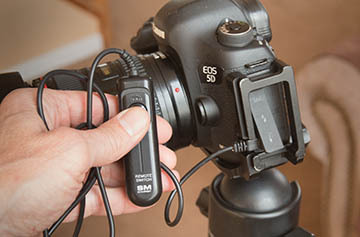 Unless you are creating some kind of creative motion blur on purpose, you must have either a cable release or a remote shutter trigger to engage your camera's shutter. The pressure from your finger depressing the shutter will cause a lack of sharpness or blur which will be magnified on long exposures. You can pick up a cable releases for for many cameras on Amazon. Some releases have a lock that allows you to temporarily let go of the button and push a second time when you want to shutter to close. In the old days, we called that a Time Exposure. Use a low ISO setting. You'll get the highest quality in your photograph, and the least amount of digital noise, if you use a low ISO setting like 100 or 200. Since you're using a really long exposure time, you don't need to set the ISO to a high setting in order to insure you're going to get a good exposure. When would you want to use the bulb mode on your question? When you want to get creative and go beyond the basic run of the mill snapshot. Here are 5 ways you can get creative using your bulb exposure setting. Shutter cord for bulb exposures. Fireworks. Probably the most wide used situation for long exposures. This allows you to wait to just the right time when the fireworks are exploding to open and close the shutter when you want, based on how the fireworks are happening. The Night sky and the movement of the stars. A locking shutter release is very valuable because your exposure will be minutes or even hours long. Traffic. The key to great traffic and moving-light subjects is finding the best vantage point to have the resulting streaks of color move in an interesting direction. Lightning. This is one of the most challenging types of night photography because of the super quick duration and unpredictable nature of lighting strikes. Painting With Light. I had a blast with this when I was only about 15 years old and first experimenting with creative photography tricks. We opened the shutter for several minutes and "painted" using the light from sparklers, road flares and electronic flashes fired through red cellophane. Those photos are long gone, but with digital photography it's easier than ever to experiment with this technique. You can also use flashlights or any other artificial light source and "paint" while your shutter is open and you are in a very dark location. 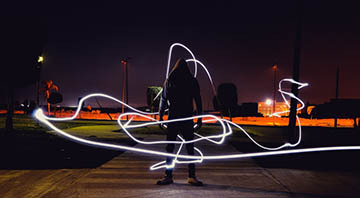 Here's a Lighting Painting Project for both adults and kids. Digital photography offers the ease of trial and error to shoot a photo, check the results, make an adjustment and shoot again when doing bulb exposures. 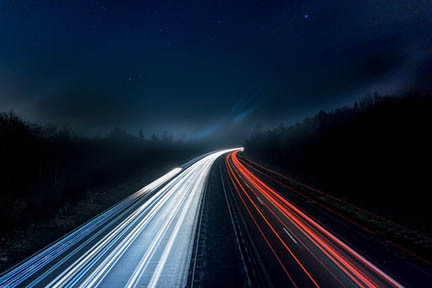 using the bulb mode on your camera gives you a way to capture the passage of time in a single photo. Keep on shooting photos. It's the best way to learn! Nighttime Photography. Helpful guide to getting great photos at night. Leave Bulb Setting-Go to Photography Definitions. Understanding the meaning of some of the terms used in digital photography will help you get more out of the articles you read. Digital Photography Tips Starting Page. The Top 10 Tips for Newbies and Advanced photographers can use to improve their photography.